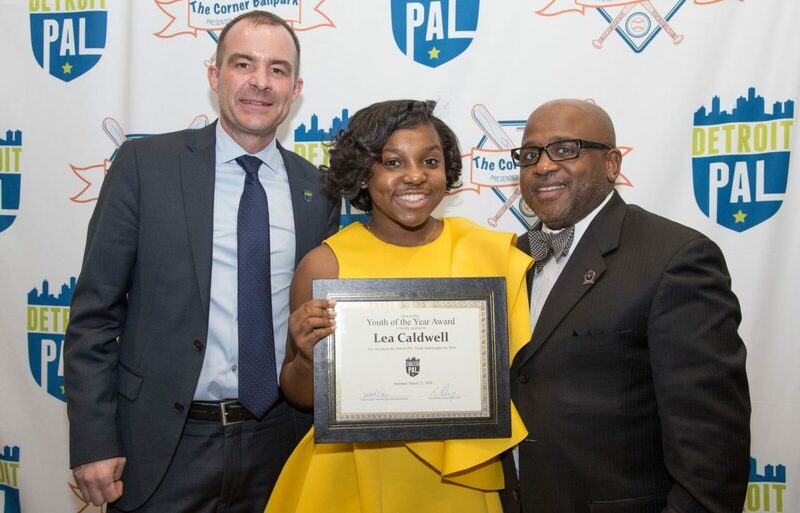 Detroit PAL is proud to announce the 2018 Youth of the Year, Lea Caldwell! Caldwell is 15 years old and has been a participant of Detroit PAL for three years cheerleading for the Detroit Spartans football team. Lea is a freshman at Mercy High School in Farmington Hills and she has what it takes to be a leader. Lea has been blessed with wonderful parents who have been her biggest support system her entire life. Not only is Lea heavily involved in Detroit PAL, she’s involved at her school as well. In addition to cheerleading and attending the Fresh Nation broadcasting program, she is involved in numerous activities at Mercy. She is a part of the science club and a group called B.A.S.E (Black Awareness Society for Education). B.A.S.E is a group of young African American girls that meet once a month and discuss topics that African Americans struggle with and they also talk about how to make people aware of these things. Lea does a good job of balancing her busy schedule. “It’s like a full-time job to me,” Leah said chuckling. “You have to have a set schedule and know how to manage your time wisely. Lea enjoys attending the Fresh Nation classes held through Detroit PAL. She wants to become a journalist when she gets older and Fresh Nation has helped her out a lot. “Lea is really good at communicating with others and interviewing people as well,” her mother said. Lea constantly works on expanding her horizon and seeing what she’s good at. In addition to participating in PAL programs and keeping up with her school work, Lea also enjoys in Girl Scouts and the Pontiac Delta Sigma Theta Academy. One of her main principles is being able to give back through community service. “I was excited when I found out that I would be Detroit PAL’s Youth of the Year. It’s a wonderful privilege which allows me to continue to be a voice for the youth of the city,” exclaimed Lea on being chosen as PAL’s Youth of the Year. Detroit PAL’s Youth of the Year will represent the 14,000 plus boys and girls PAL serves for the entire 2018 year. Lea will have the opportunity to attend fundraising events, PAL athletic events, and more. She received her award and gave her speech at the MVP Awards Dinner on March 23rd. Congratulations Lea! We are looking forward to 2018 with you as our Youth of the Year!